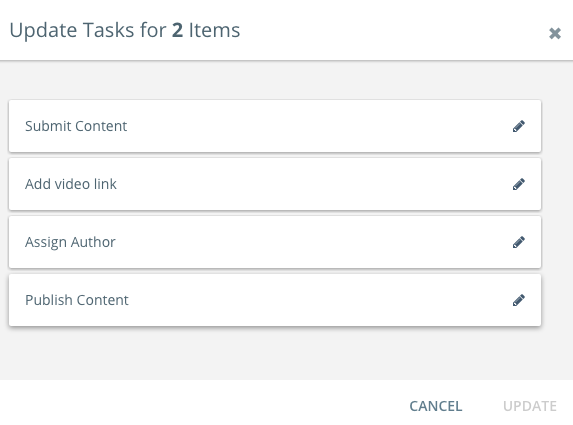 In Kapost, you are able to update tasks across multiple pieces of content and initiatives through a bulk action. This bulk action should help to save time when trying to make updates to workflows on existing content or initiatives. 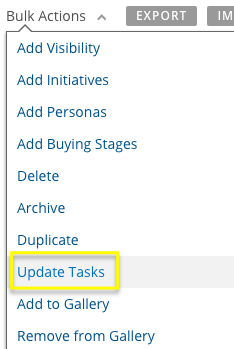 Note: After you click Update Tasks the window will display ALL tasks in All of the content assets or initiatives selected. 6. 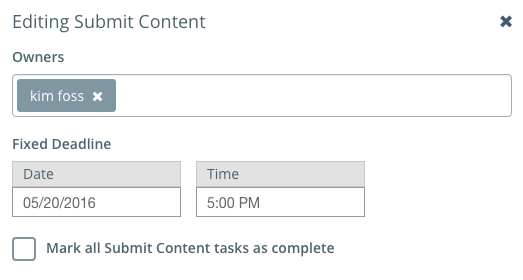 Select task owner(s), task deadline or check the box to mark the task as complete. You can close out of the edit box and continue to edit more tasks. Any task you have edited will display as 'modified'. 7. After editing all tasks you wish to edit, select Update to apply changes. Note: Any owner or deadline that is added will replace any existing owners or deadlines on the task after Update is selected.